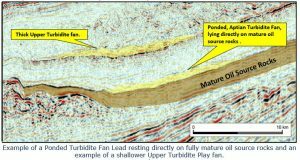 Pancontinental believes that PEL 87 is highly prospective for oil, with high quality mature oil source rocks and the potential for very large oil traps. Water depths are between 500m and 3,200 m and the area is on trend with the actively explored Total / Impact Oil and Gas deepwater block, the subject of a farmin by Total in October 2017. Pancontinental has a large interest in this area. 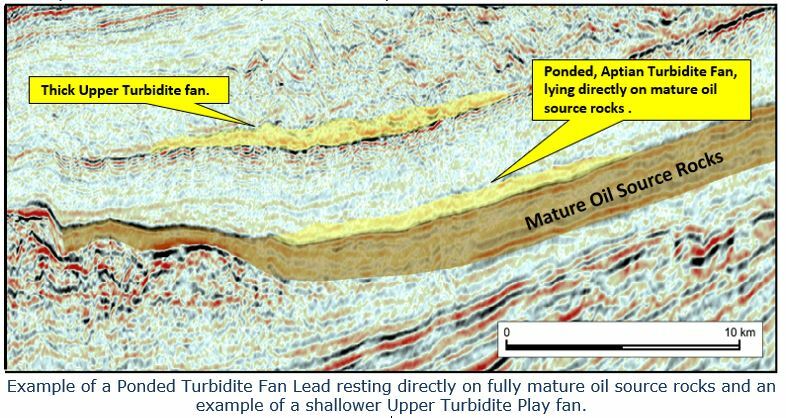 Preliminary mapping already shows evidence of traps in large turbidite fan plays . 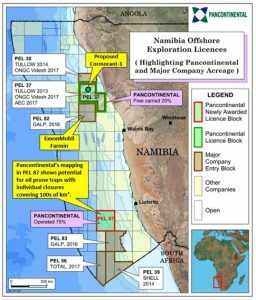 In December 2017, Pancontinental signed a Petroleum Agreement with the Ministry of Mines and Energy of Namibia (Ministry) and Namibian partners for PEL 87 offshore Namibia. Pancontinental is the project Operator, with a 75% interest. PEL 87 is a large, 10,947 km² area on trend where industry giants Shell, GALP (Portugal) and Total (in 2017) have acquired interests. It is Pancontinental’s second Block award offshore Namibia. The Company has already mapped a number of leads with very large oil volume potential. The Block has an initial period of 4 years, and an innovative exploration program is planned. 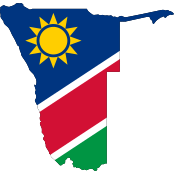 The Petroleum Agreement is subject to standard fiscal terms in Namibia that are considered excellent by world standards. The above image highlights that PCL’s acreage is in the same areas being targeted by major oil companies. Pancontinental believe that offshore Namibia is one of a select few areas around the world with the potential for large oil discoveries in modest to deep water that can be profitable at prevailing oil prices, and highly profitable at better prices. It is clear from recent activity that some of the world’s pre-eminent oil companies agree with us. Namibia offers a stable, pragmatic and complementary fiscal regime with the potential for large oil traps and high quality reservoirs. Mapping has already shown leads in play trends with very large oil volume potential. So we have taken a majority, 75% operated position in the new project with cost exposure within our capabilities. Further, we plan to apply our proven skills to bring the oil potential of this project into an up-to-date context that is attractive to wider industry investment. 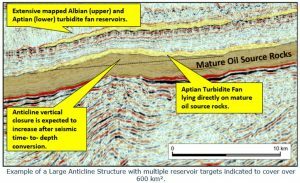 Pancontinental believes that PEL 87 is highly prospective for oil, with high quality mature oil source rocks and the potential for very large oil traps. Water depths are between 500m and 3,200 m and the area is on trend with the actively explored Total / Impact Oil and Gas deepwater block, the subject of a farmin by Total in October 2017. 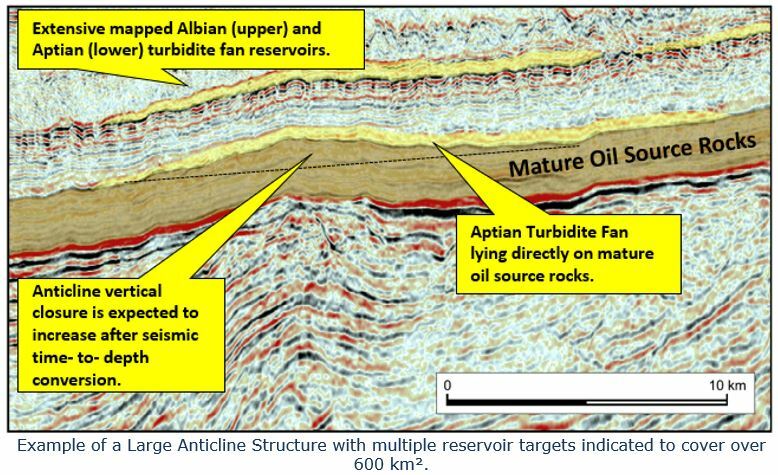 The new Pancontinental project area is in a region where high-capacity oil prospects, such as large turbidites, have been identified. Pancontinental signed the new PA with the Ministry of Mines and Energy of the Republic of Namibia alongside Namibian partners Custos Investments (Pty) Ltd (15%) and Namcor, the National Petroleum Corporation of Namibia (10%). Pancontinental has a 75% interest and is the project Operator. Pancontinental’s commitments to PEL 87 for at least the first two years are amply within the Company’s financial capabilities. The introduction of aligned industry partners will be considered as the project progresses, in keeping with the Company’s proven strategies and expertise as evidenced by the structure of the PEL 37 joint venture. 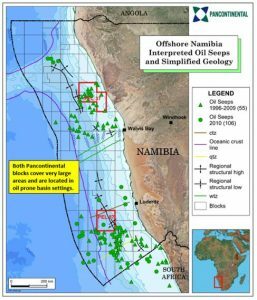 The Namibian partners will be carried through the exploration phase of the Licence. 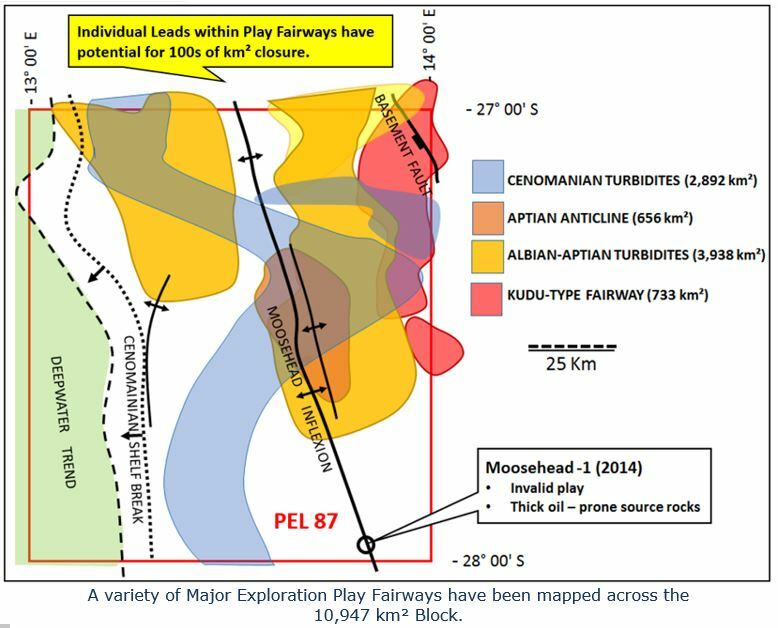 Exploration activity has already commenced on the new PA area including data acquisition, initial geological and geophysical mapping and compilation of leads and prospects. 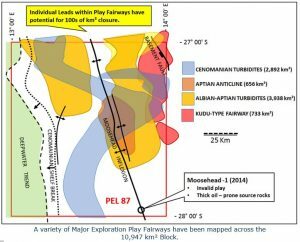 Prospective “fairways” and potential traps covering large areas adjacent to mature oil prone source rocks have already been identified and will be the subject of ongoing exploration work. The above image shows clearly that PCL’s acreage is oil prone.